We have been organising a Belly Dance class at our condominium for a while. But the number of attendance has been dropping. We are considering stopping it. 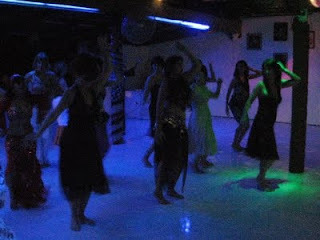 There happened to be a belly dance party on Saturday, organised by our belly dance instructor, Azlina. It was at a beach side bar in Batu Ferringhi. I went there with Jason. The tables were set on the beach and we had buffet dinner under the sky. Azlina had a couple of performances. There were lots of her students invited and lots of us were invited to join her on stage and danced together. It was so fun. If our class is still on by the time her next party is happening, I should go again with, probably only female friends, because Jason looked a bit out of place!